What Types of Films Over-Perform in China? For international distributors whose films underperform in the global market, China can sometimes offer a welcome boost. Even when they fall flat elsewhere, some foreign films perform extremely well with Chinese audiences. And occasionally, big global hits that do well everywhere do even better in China. This phenomenon is what distributors call “over-indexing;” that is, the situation when a film performs significantly better in a given market than its performance in other markets would lead one to predict. With China now accounting for about 5 percent of global box office receipts—$1.6 billion out of about $32 billion worldwide in 2010—one would expect a “typical” foreign film to take in 5 percent of its theatrical revenue from a China release. And indeed, the median indexing film this year, Lionsgate/Mandate’s The Next Three Days, took in almost exactly 5 percent of its $70 million in global revenue from China (Note: international revenues are difficult to come by; for this report I am relying on public sources such as boxofficemojo.com and IMDB.com, which may in some cases provide information that is inaccurate). Let’s take a look at the foreign films that over-index in China, and see what patterns emerge. Sony’s sci-fi-action film Battle Los Angeles has been the highest indexing foreign film in China so far this year, with 15.4 percent of its global revenue coming from Chinese ticket sales. On top of its $82 million in U.S. receipts, the film took in an additional $133 million overseas, with an impressive $34 million of that total coming from China. 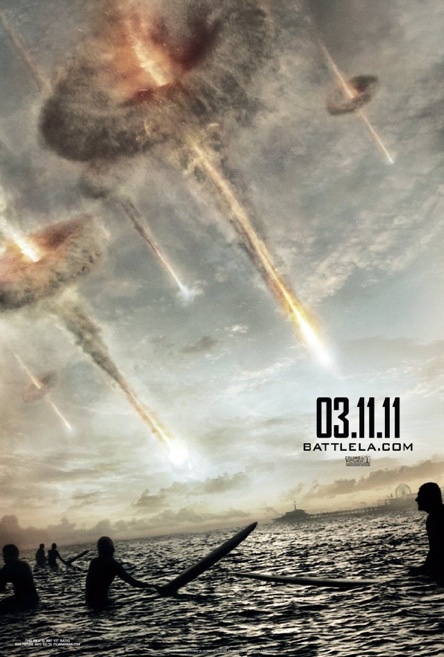 As it happens, Battle Los Angeles is the prototypical China over-indexer. Almost every one of the top 10 over-indexing films in 2011 is either a sci-fi or action film, or in several cases, both. CG special effects are also a big factor in these films, as is evidenced by the second highest over-indexer, Transformers: Dark of the Moon. Transformers earned a whopping $165 million in China, for 14.5 percent of its global total. Although it presents an exception to the sci-fi/action rule, it’s fairly obvious why the third highest over-indexer, Kung Fu Panda 2, did disproportionately well in China. In addition to its strong local cultural appeal, Kung Fu Panda, like Transformers, was a sequel to a franchise that had previously out-performed at Chinese theaters. These films outperform in China for the same reasons they outperform in other non-English speaking territories: they are long on spectacle and (mostly) short on dialogue and character emphasis; they provide a level of effects and production value that can’t be matched by home-grown films; and they target the prime movie-going demographic of 12-25 year olds. Of course, many films don’t perform so well. 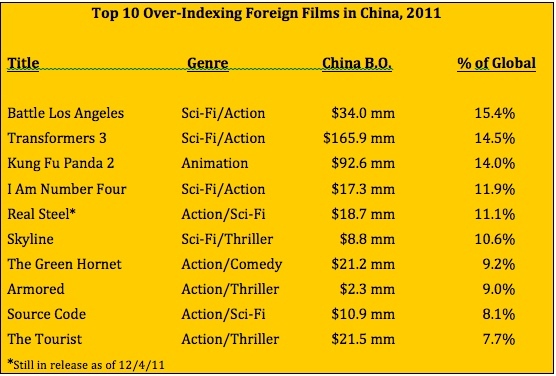 It can be just as instructive to take a look at those movies that under-index in China. What went wrong with these films? Note that there are no science fiction movies on this list. Cars 2, an animated film, had no built-in following in China, and likewise for Rio and Alpha and Omega. It takes an especially targeted animated film like Kung Fun Panda 2 to draw Chinese audiences, or one with characters and stories that they know well. Two of the other under-indexers, Thor and Captain America, are superhero pictures. There is no tradition of superhero stories in China, and apparently not as much interest in these types of films as there is in other markets. As for Red and The Eagle, it may be that the casts or stories didn’t click with audiences, or perhaps that they weren’t marketed well. Both were distrbuted by the extremely busy China Film Group, and perhaps they just fell through the cracks at times when CFG had its hands full with other movies. One big lesson to take away is this: For a producer with a sci-fi film that is likely to succeed in China, it’s worth considering making it as a co-production, in order to get around the import quota. Co-productions return as much as 40 percent of Chinese box office revenues to their owners, as opposed to just 13-15 percent for quota films. In the case of a film that grosses $100 million or more in China, the extra revenue could make it worth the extra effort of working with Chinese partners. And with the way China’s box office is growing, there are certain to be many more $100 million grossers in the future. This entry was posted in Analysis, Opinion and tagged Battle Los Angeles, China box office, China film, China Film Group, Over-indexing films, Rob Cain, Transformers: Dark of the Moon, under-indexing films by chinafilmbiz. Bookmark the permalink.